"...savor the tropical ambiance at La Palapa"
La Palapa Bar is the perfect place to meet with a group of friends, wait for a table for dinner, or enjoy the romantic ambiance and an after dinner cocktail with someone special. Candlelight and the fresh sea breezes mix with the delightful view of fishing boats anchored off the shore under the moonlight. Add to that live music seven nights a week, a creative drink made with fresh fruit of the tropics or a special coffee, and life doesn't get much better than under the palapa! From classical dinner music to traditional jazz, new age, flamenco, and rhythm & blues, the live-music scene along the shores of Puerto Vallarta is as diverse as its people, culture, and beauty. Musicians from around the world have found their way to Vallarta to play for our entertainment and La Palapa Restaurant is proud to feature some of these talented musicians. Not only do all of these musicians perform together on stage, but they also have recordings of their music available at each of their performances. To learn more about these talented artists and to sample their music, click on the links below. 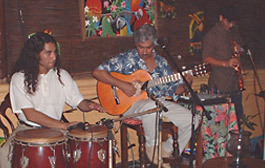 Alberto Perez - the owner of La Palapa, is a talented musician who sings and plays latin jazz on his guitar. Raul Simental - not only sings and plays his guitar at La Palapa's bar, but is also an artist whose paintings grace the walls of the restaurant. Oscar Terrazas - a talented musician who adds the sensual sounds of alto sax to the music five nights a week. Rigoberto Mora - a master of the classical guitar who has been active in the local music scene for more than 20 years.